there was a way to help thousands of amputees, all around the world, with simply an App?! Can you imagine the far reaching implications?!! To say we’re excited about this development is quite an understatement. I am an analog Prosthetist. I love to modify with plaster and make what I believe is the best prosthesis I can provide for a patient. One night while I was modifying I was talking with a friend and he said, “You mean to tell me a computer can’t do what you are doing.” I was honestly appalled, how could he say that, what I do is an art! He continued to tell me about a iPad attachment that he read about on some techie website. That interaction with my friend got me thinking, is there a way to turn and analog prosthetist to a digital prosthetist. Since then I have been working on a simple way to create an .stl or .obj file that can be scaled and then sent directly into your fabrication work flow. DigiScan 3D uses the structure.io scanner and an iPad. Some clinicians have found that they use an outside shape manipulation software, others have found ways to scale their model and go straight to test socket fabrication, while others just want a file they can keep in their electronic medical records. I wanted a simple way to capture a shape and not push people to buy a specific shape modification software. Lastly, this app has a purpose. ALL PROCEEDS go to making prostheses in the developing world. Please read below to see how using this app will make a difference in someones life. DigiScan 3D is an intuitive portable shape capture tool for prosthetics, orthotics and hobbyists looking for a solution to quickly create a 3D image using the Structure Scanner. You decide how you will use the tool. You can now email a .stl file and .obj file with appropriate scale and units straight from your iPad to the fabrication facility or shape manipulation software of your choice. What’s that mean in simple terms? 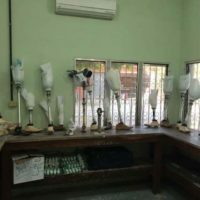 LifeNabled could train nearly anyone to take a digital scan of an amputees limb, send the file to a be professionally modified by a prosthetist (on the computer) and then 3D printed for the exact shape needed for the prosthesis. That’s it! No casting, no fiberglass tape, no plaster, no hands-on modifying, everything happens digitally…until the final product is produced! LifeNabled is still researching the outcome potential, and tweaking glitches along the way, but we need your help to continue funding this cutting edge, technological advancement. The scale feature allows you to do global reductions/additions to your model in alignment. As a clinician you now have a way to quickly capture shape and keep it on file so you can refer to the scan at a later date. As a hobbyist you can email the file to yourself and open it in the manipulation software of your choice. We do not collect information regarding how you interact with the app. We suggest you use deidentified data if the shape capture scan is transmitted via email. To use the digiscan app, you will need an iPad or iPhone as well as a structure sensor. The structure sensor can be purchased here. The app is free to use to capture a shape however once you want the file you must choose to subscribe to one of the time options. Once you subscribe you are able to have unlimited scanning and emailing during that period of time. This App is a tool and should be treated as such. There are many option on how you choose to use it. Our main purpose is to provide a consistent way to capture shape. DigiScan does not collect any personal data within the app. The only data that is available to us is available through the App Analytics in iTunes Connect. By downloading or using the app, these terms will automatically apply to you – you should make sure therefore that you read them carefully before using the app. We are offering you this app to use for your own personal use as a subscription, but you should be aware that you cannot send it on to anyone else, and you’re not allowed to copy, or modify the app, any part of the app, or our trademarks in any way. You’re not allowed to attempt to extract the source code of the app, and you also shouldn’t try to translate the app into other languages, or make derivative versions. The app itself, and other intellectual property rights related to it, belong to LifEnabled. LifEnabled is committed to ensuring that the app is as useful and efficient as possible. For that reason, we reserve the right to make changes to the app, at any time and for any reason. We will never charge you for the app or its services without making it very clear to you exactly what you’re paying for. It’s your responsibility to keep your device and access to the app secure. We therefore recommend that you do not digitally modify your mobile device, which is the process of removing software restrictions and limitations imposed by the official operating system of your device. You are solely responsible for what you do with the data that is derived from Digiscan. The app is a tool that allows you to use the data in creative ways for the purposes you desire.